Each weekend, anyone can enjoy a vast array of music but earlier than most nightclubs. One venue with a rich musical history puts on regular performance every Friday and Saturday evening. On a cold February night, Memphis musicians Roger Wild and Jeremiah Clark performed a concert at Otherlands. The coffee bar has been in operation on 641 South Cooper since 1994 and has been doing live shows ever since. The first performance of the evening was by Wild, who has appeared twice at Otherlands. 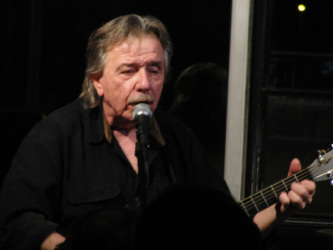 He has performed at coffee shops across America for roughly 40 years. These musicians are just a few of many performers who have played at Otherlands. Since becoming a music venue , the café has provided space for any kind of performance or recital. People can listen to new, fledgling artists sharpening their skills while in a family-friendly atmosphere. The Memphis Acoustic Music Association puts on shows each month. They are intended to encourage established songwriters to have more live concerts. “Every single artist who plays here more than once, without exception, is a pro,” said James Manning, who books the bands. In terms of enjoyment, Otherlands is the place where musicians like performing for the fans, who come for the music. Manning says that he is happy to see the performers’ enjoyment on their faces every time they walk off stage. Fans, too, enjoy the music each weekend to the coffee shop. Giddy Romero, a Shelby Forest resident who used to live in Cooper-Young, has been coming to Otherlands since the 1990s. Her favorite musician was Wild, who has known her and her husband for years. “Otherlands is a really nice place and has a great atmosphere,” Romero said. Otherlands has guests throughout the year that cater to all musical tastes. Manning says that he is fortunate to be where he is. “It is fun in an ‘almost famous’ kind of way,” he said. _ Chris Freitas covers Arts and Entertainment for MicroMemphis. You can send him story ideas here. You can follow him on Twitter (@chrisfreitas23).